At Chelsea, we encourage students to embrace the gift of learning differently. We shatter the stereotypes everyday and give our students the tools to thrive. From admission to graduation, children who attend Chelsea School embark on an incredible journey and a lifetime of learning. Chelsea School students are middle school and high school students (grades 5-12) with language-based learning differences and ADD/ADHD. The number of students varies from year to year. Our middle division (5th-8th grade) has approximately 20 to 30 students. Our upper division population has varied from 50 to 70 depending on the year. Chelsea students are promising, intelligent, often brilliant pupils with the ability to exhibit high-level thinking skills, to grasp information presented in a multi-modal format, to compare, contrast, hypothesize, and analyze information, and to succeed in non-traditional assessments. Students at Chelsea School have a language-based learning difference and, in traditional school environments, these gifts have not been allowed to flourish. At Chelsea School, our students receive individualized instruction that appeals to the unique ways in which each of them learn. Different learning styles are celebrated, fostered, and developed at Chelsea. At Chelsea, we recognize that each student learns in different ways. That is why our teachers create classrooms that are vibrant, stimulating centers of learning. Chelsea Teachers specialize in remediation through individualized and differentiated instruction. These multi-sensory classrooms draw students into lessons regardless of whether they are visual, auditory or kinesthetic learners. Our students engage with challenging course material, authentic-learning opportunities and enriching co-curricular activities that support and cultivate their varied interests and talents. Our students have the potential to be leaders and doers; over 99% graduate with a Maryland high school diploma and for more than 90% of students, the path through Chelsea School leads to either college or vocational school. Our students have potential — to be artists, athletes, designers, innovators, performers, writers and luminaries. Chelsea Students earn the same diploma as public school students in the jurisdictions we serve and are held to the same academic standards and educational requirements as set by the Maryland State Department of Education and the Office of the State Superintendent of Education. 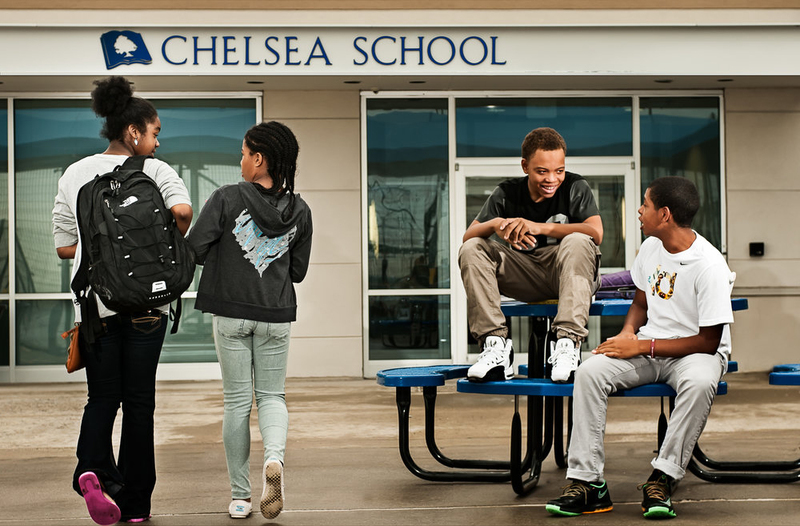 Chelsea School accepts students who are funded by their local school districts in the DC Metro Area as well as students whose families pay for Chelsea School’s unique program privately. Approximately 30% of our current student population is private pay families.